Excess and waste, greed and exploitation dominate our planet and will inevitably lead to the destruction of our world. HANDLE WITH CARE is the appeal of the OSTRALE’015 ! For the 9th time the OSTRALE presents on over 20,000 square meters of exhibition space international contemporary Art in Dresden. Andreas Hetfeld shows an installation that he realized together with Suus Baltussen in 2010 in The Netherlands. 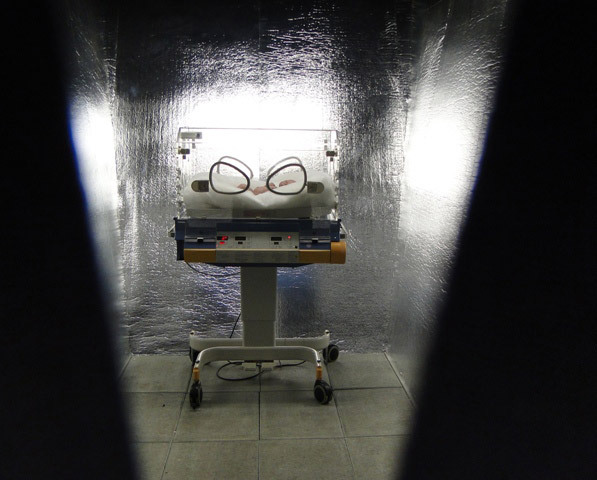 The installation was honored with the audience award and because of its deep emotional effect it caused remarkable discussion: a lifelike baby presented in an incubator surrounded by the sweet sounds of a lullaby, makes the observer ask himself what is wrong with the baby.